In this short article I will explain the most important setup aspects for sport hydro hulls. The points covered can also be applied to some outrigger hydros. I will not cover things like center of gravity and engine placement as these should be supplied by the hull manufacturer. In most hydros the engine will end up being considerably forward of the leading edge of the turn fin. The CG will end up closer to the leading edge of the turn fin. This is generalizing and varies from one hull to another. The turn fin is what the boat "pivots" on when the rudder is turned. Moving the CG away from the point of pivot changes the turning characteristics of a hydro considerably. The optimum setting should be something the manufacturer can supply. In many cases they will tell you where to position the engine. This will usually put you real close to optimum setting, but if you want it perfect you can experiment, or ask the manufacturer to tell you exactly where the hull should balance (C.G.) and move the internal components in your boat until you get the boat to balance at the specified point. Usually C.G. is measured from the transom forward, either in inches or in percentage of hull length. *on hydros often instead of C.G. we will talk about "tail weight". This is the weight of the boat at the strut when sitting flat on a table. This is a VERY important number when setting up hydros. Enough about that, now let's get to the hardware setup, what this article is about. 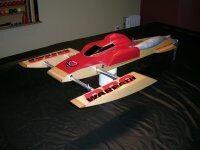 To properly setup a hydroplane you HAVE TO have a FLAT table or setup board to work on. This surface must be wide enough for the sponsons to both sit flat on and must be long enough to span from the strut to the sponsons. The first thing to do is to set your boat on the table with the turn fin hanging off the side but both sponsons and the strut laying flat on the surface. To do this, it's usually easier (and better) to remove the rudder blade. If the rudder extends past the back of the strut you can leave it on, otherwise remove it so you can move the boat forward on the table and have the entire strut bottom over the table surface. This is important when adjusting the strut angle. In most cases the manufacturer will recommend 0 angle on the strut. They should also recommend a starting depth for the strut, usually measured from the bottom from the hull at the transom to the center or bottom of the strut. To properly set the strut, hold it flat against the table and raise or lower the hull to the specified height. Lightly tighten the adjustment bolt(s) and double check your height. Make sure the strut is still flat on the table. This is checked by ensuring you do not see light under the strut when looking at it from the side, parallel to the table. Fasten the adjustment bolts and triple check the strut. If the manufacturer recommends some positive or negative angle it is a little trickier. You can use a see through protractor to make is easier, or better yet use some shims. You can calculate the shims needed for your strut using Pythagoreans Theorem. If you want 2 degrees positive, you need a .060" shim. For negative angle, do the opposite. Shim the front of the strut with the back touching the table. During all this, the boat must always be sitting with both sponsons on the table. Remember to check the strut depth after angle trim is applied. Setting the strut accurately is important as it will affect the ride attitude of the hull drastically. After you have set the strut properly, it is a good idea to scribe a line on the blade along the mounting brackets. This way if you must make adjustments later, you can always get back to your initial setting quickly. On some of my boats I have 2 or 3 scribe lines for quick adjustments according to water conditions. I make these marks after successful testing. Setting the rudder is pretty straight forward. Unless the manufacturer specifies otherwise, you will usually want the rudder perpendicular with the riding surface of the boat. In this case, this means perpendicular to the table surface you just used to set the strut. For this reason it is VERY IMPORTANT to set the strut first! With the strut adjusted, install the rudder blade and check that it is 90degrees with the surface of the table. The boat must be sitting flat with the strut and both sponsons on the table. If the manufacturer recommends some inner or outer tilt, you can check and adjust with a protractor again using the table as reference. Never rely on the transom to check the rudder angle. Some (if not most) transoms are not at a perfect 90 degrees with the bottom of the hull. In addition, on a hydro the transom angle isn't really important as the running attitude of the boat is dependent on the strut depth adjustment. Although in most cases rudder tilt is not used on hydros, it is important to know the effects. Tilting the rudder forward (bottom of rudder towards the front of the boat) will have a tendency to pull down the tail end of the hydro in a turn. Consequently, tilting the rudder back (bottom away from the transom of the boat) will have a tendency to lift the tail end of the hydro in a turn. There are two different types of turn fins more commonly seen on hydros. One has a straight bend and the other is a curved type. Both are pictured below. In most cases the manufacturer will specify where to mount the turn fin and how to adjust it. Some will even pre-mount the bracket for you. Again this varies from hull to hull. What I want to discuss here is more how to tune the fin for desired performance using tilt. Tilting the fin forward (bottom of fin towards the front of the boat) will have a tendency to make the boat track to the left and exert some lifting force on the right (starboard) sponson. Tilting the fin back (bottom of fin towards the back of the boat) will have a tendency to make the boat track to the right and pull down on the right (starboard) sponson. I have noticed that with straight bend fins the tilt seems to affect tracking mostly. With the curved fins tracking doesn't seem to be affected as much but tilting the fin really affects how tight the front end gets. Again this varies but knowing the effects tilt can have on a turn fin can really help you fine tune your boat's handling. This isn't an adjustment, but more something that you should pay special attention to when building your hydro. What I am talking about is the stuffing tube. The stuffing tube on a hydro is very long. In theory the hydro rides on the front sponsons and the propeller (assuming there are no rear sponsons as seen on some outriggers and other hydros) but the fact is that in reality the stuffing tube is quite frequently in the water. For this reason you should keep it as straight as possible from the point it exits the hull to the point where it reaches the strut. You can easily imagine the effects it can have on performance if it's crooked and in the water when the hull is running 60mph plus! I hope this will help some of you fine tune and get the best possible performance out of your hydros! Hi Marc...i found this article very useful since i am always searching for how to setup my hydro hull. The settings will vary from one hull/setup to another, but the basic techniques should be the same. My Seaducer: strut is currently at 1-13/16 from bottom of boat to bottom of strut. I am also using a different prop now. It is a VIPER from VOODOO PROPS...this prop really woke up the boat. Anyone who saw it run at the Northern Nats will agree it was easily the fastest sport hydro there! How highly did you adjust the Strut now?